So…I know most people already know how to make French toast. In fact, I would bet that even the people who don’t consider themselves cooks know how to make it. And for good reason: it’s easy, it’s delicious and it’s made from ingredients most people have in hand. In fact, French toast was invented to use up stale bread! Although we in America think of it as a treat (rightly so), it’s wonderfully practical at using up ingredients that might otherwise get tossed. The custard element can make petrified bread not only edible, but soft and delightful again. How many of you find yourself with odd leftover hamburger or hot dog buns after a meal? I know I do. I hate to throw them away, especially since I buy specialty buns made of pretzel dough or brioche. But will they last until next time? I now put those “odd buns” in the freezer. 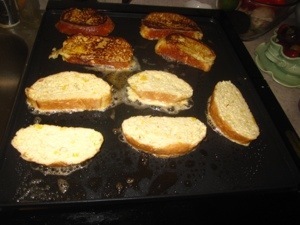 When I have teo or three collected, I take them out (they can defrost in about 20 minutes or less) and make French toast. 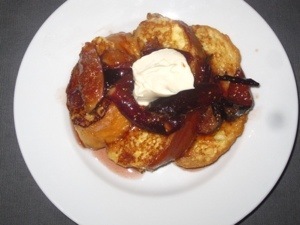 I love making this French toast, even for dinner. I mean, come on, who doesn’t love breakfast for dinner? I had something similar to this recipe in a restaurant the other day and I loved it so much I wanted to make my own version. In two weeks I will be back in school and my daughter starts first grade this Thursday. So I tailored this recipe to be really easy. The syrup can be prepared up to two days in advance and the topping can be made up to a week before. Like I said before, use up some old hamburger or hot dog buns (maybe not the ones with onions on them – haha) or bread that is going stale. Or use your favorite kind – whatever you like! I am using leftover brioche buns in these pictures. Brioche is an egg-fortified bread that is very similar to Challah bread. It’s soft, chewy and very mild in flavor. Excellent French toast material. I stole this trick from a chef being interviewed on Food Network, and I am so glad I did. The mixture of eggs and milk is what makes the custard. The egg yolks just make that richer and more luxurious. For 8 slices of bread I do a custard ratio of 2 egg yolks, 2 eggs to 1 cup milk blend. Using 4 eggs will be just fine too. You do need the eggs for this however because it is what makes the custard. Otherwise you just have bread soaked in milk. I like to use ½ cream, ½ milk. You can use half and half, nonfat, anything you like. I have never tried a non-dairy on this but I think the egg with soy milk might work ok.
No imitation. Pure or don’t use it. Fake vanilla is no bueno. The is going to add just the tiniest hint of warmth and sweetness to the bread. Yes! Salt in a sweet dish! It will bring out the other flavors. It is a sweet dish so make that pinch on the small side. KOSHER please. You may get too salty using table salt. I am big on pure and real maple syrup. I love it and I feel it is the healthiest choice. If you don’t like it, use regular syrup. If you have neither, put ¾ cup sugar and ¾ cup water in a saucepan. Heat without stirring until sugar is dissolved. Bring it to a quick boil then let cool. Boom – you just made simple syrup. Then just follow the instructions below as if it were the maple. I love figs and they are in season right now in August. They are incredibly sweet and delicious. If you don’t like them or can’t find them, apricots or plums would be a good substitute. Cardamom is not a very common spice in America, but it is very popular in India, the Middle East, North Africa and Scandinavia. I think it has a warmth and spice similar to cinnamon but with a slightly bitter finish. It’s delightful! A little goes a very long way, so be careful. But you won’t regret trying it! It won’t be a center flavor here, just that thing that will make someone say “mmmm! What IS that? It’s amazing!” I love using ingredients people aren’t familiar with. For one thing (let’s be honest) it makes me look cooler that I know how to use that stuff. Plus it opens up whole new worlds of taste! For those of you not familiar, crème fraiche (pronounced crem fresh) is essentially a French sour cream. It is thicker and creamier than the American version. Also, in my opinion, the “tang” of crème fraiche is much rounder, with less of a punch or bite. This is what will lend some sweetness to the crème fraiche we are topping the French toast with. Honey’s floral flavor will compliment everything nicely. If you like things a little less sweet, then just omit the honey. Preheat oven to 250𱺝. Pull crème fraiche out of the fridge and set aside on the counter to come to room temperature. I warm the oven so that I have a place where the French toast can stay warm while the syrup and topping are being prepared. When the crème fraiche is room temperature it is easier to work with. In a casserole dish, whisk together eggs, egg yolks, milk, cream, salt and vanilla until completely incorporated. Two at a time, lay the pieces of bread in the custard mixture. Count to 3 then flip bread over. Count to 3 then remove. You don’t really have to do the counting. It’s just my method of getting the bread to fully absorb the custard without soaking up too much and getting soggy. On a nonstick griddle or skillet melt 1 tablespoon of butter. Over medium to medium-high heat, cook until golden brown (probably about 2 to 3 minutes per side). Place on baking sheet & place in oven to stay warm until serving. The butter just helps the browning process. How fast this happens will depend on your stove. In a small sauce pan, pour in maple syrup and raise heat to medium. Drop in figs and cardamom. Bring to a boil then reduce heat to low for about 5 minutes. Turn off heat. This is infusing the maple syrup with the fruit and cardamom. 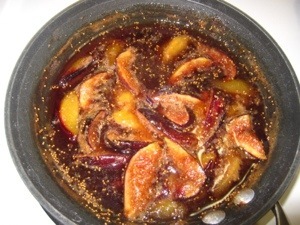 It will get some fruity flavor in the syrup itself and also soften the figs. Whisk honey into crème fraiche until completely mixed. Again, if you don’t want the honey leave it out. But I love it. Serve French toast with syrup and figs topped with a dollop of crème fraiche. Thank so much for visiting me this week! I hope you try this and/or any of my recipes. And if mine don’t work for you then find some that do. Just try to do what you can. It’s pretty hard to completely change overnight. If you are just starting out, take baby steps – eventually you will get there. Try just cooking one time a week and increase as you go. And I am always here, happy to help answer any questions you have. Thank you for reading my recipe! I have also included a printable version of this recipe here without all my witty repartee (ha-ha!). I hope you enjoyed it enough to try it!